We've already taken a look at the new environments in Square Enix's MMORPG reboot, Final Fantasy XIV: A Realm Reborn. Now, how about some action! All of the traditional Final Fantasy Job Classes have fallen into place, as usual. Warriors and Paladins, Monks and Dragoons, Bards, Black Mages and White Mages. I can feel the nostalgia pouring from my fingertips just from writing their names. Any early favorites? I played a Red Mage in Final Fantasy XI, and I didn't especially enjoy being nothing more than a squishy bag of flesh. I'm thinking a bit more heavy hitting this time around. Monks or Dragoons? Those interested in finishing out the final stages of the beta test can sign up at Square Enix's website. 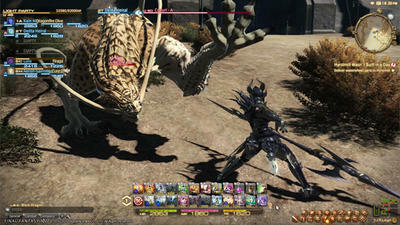 Final Fantasy XIV: A Realm Reborn's official launch date will be August 27th for the PlayStation 3 and PC. Subscription plans will be announced soon enough.